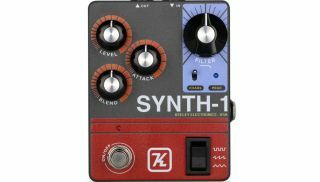 A guitar-triggered, single-note wave generator, the Synth-1 can make your guitar sound like a fuzzy synthesizer. The tone of the wave can be adjusted using the Filter control, with the lead-in time or swell determined by the Attack knob setting. The Blend control can be used to rid your guitar of its natural tone. The pedal's Chaos switch is appropriately named, while you can also use an expression pedal to control the filter for wah-wah. The Keeley Synth-1 is available now for $179, though Keeley's website does currently list the pedal as "out of stock."